I have sent several test and on site emails from www.katyfencerepair.com and the "attached files" never seem to go thru. I tried w/ default email, then personal and then both ...nothing. I see you are using the Filepicker.io upload button, which is inttended to upload any file from the Cloud or from the local drive. 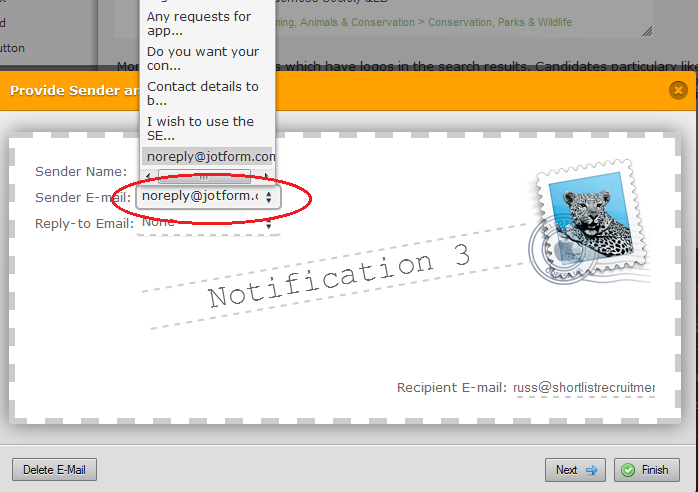 Please set the sender email address to noreply@jotform.com , as I see you have not selected anything on that field . Also, choose a field from your form for the sender name field . Ussually , the name field of your form should go there. When I recieve the message in these emails, the ones that go to my phone, there is no attached files. Any ideas? Uploaded files will not get forwarded , they are either hosted into our servers and all you recieve into your email is a link to them. If your users upload files from the Cloud, they will also be hosted into those servers and you'll get an external link to them . However, there is a workaround I can suggest to you , and it is about to integrate your form with dropbox. That way, you will actually recieve the file itself instead of a link.